Are you searching for affordable flooring with the look and performance of high-end products? Then, come to our locally owned flooring store for laminate flooring that is as easy on your eyes as it is on your budget. Let our design and sales professionals show you stylish and durable laminate floors that mimic such high-end materials as hardwood, natural stone, and ceramic tile. laminate wood flooring and laminate tile flooring have four layers of construction. On top is a clear protective layer. Underneath are a design layer, a core layer of strong, high-density fiberboard, and a backing layer that provides stability and guards against moisture. The design layer is the secret to laminate’s authentic look. When you see a piece of laminate, what you see is a high-quality digital image of a plank of hardwood, a slice of stone, or a piece of tile. That is why laminate flooring installation looks just like the real thing. Since laminate is manufactured flooring, you can expect it to be tough and resilient. This is no-fuss flooring that your children can play on and your pets can run across. Cleaning is easy. Just wipe up spills as they occur. Dry mop laminate floors when needed and damp mop upon occasion with a laminate floor cleaner. Rely on our sales professionals to help you find the brand, grain, and gloss that work with your home décor. Let us show you laminate flooring with the look of hand-scraped or distressed hardwood. 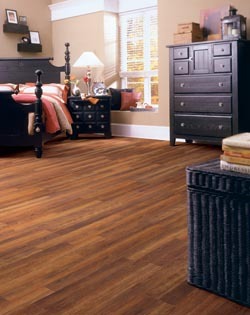 All of our laminate floors come in planks similar to real wood and install like planks - piece by piece. These floors are available in numerous sizes, shapes, textures, stains, and finishes. Save money on laminate floors that look just like luxury stone or ceramic tile. Are you on a budget for your new flooring? Enjoy great value in an array of stunning styles with our laminate floor options. We offer you a wide array of choices of this high-performance flooring, which ensures you can find the flooring that best suits your needs in looks, performance, and price. We are committed to complete customer satisfaction in all of our products and services. That’s why we recommend professional installation for long-lasting floors that resist damage. Our skilled flooring technicians have years of experience in installing laminate floors the right way. Plus, we give you a lifetime guarantee. If you are not satisfied with your laminate flooring installation within 30 days, we will fix any installation problems at no charge to you. Learn more about the benefits of laminate flooring. Call our showroom today. We proudly serve the communities of Lubbock, Levelland, Plainview, Seagraves, and Littlefield, Texas.